RedaFact is a compact, web-browser based editorial sofware system, specifically developed for small- and medium size publishers of (weekly) papers and magazines. It consists of a mySQL database accessible via a web-portal via which articles, pictures, and additional placement preferences can be uploaded for publication in print and/or online. 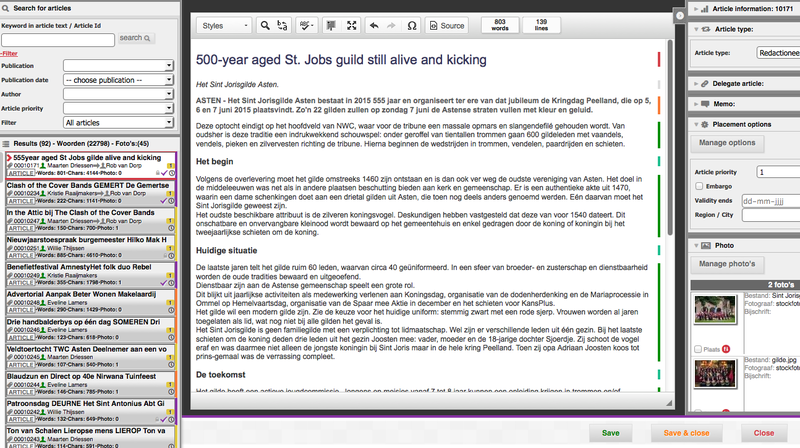 Article texts can of course be formated, so that the correct paragraph style is set when layouting the pages. The web portal serves as a personal archive per user (reporter/journalist). Only when an article is released, this becomes visible for the chief-editor for editing, priority setting and publishing in one or more editions (print and/or web). In addition, a chief editor can delegate an article to a reporter/ journalist to write a story (with a maximum amount of words). Articles can be uploaded title- independent, but users can also be limited to write/edit for one or more publications only.